In its 33rd annual year-end industry review, the WPP-owned agency is forecasting a rebound this year in North America (which last year increased its spending by 3.6% to $23.1 billion), along with continued steady growth globally. While estimated spending in other regions of the world met projections, the smaller increase in the world’s largest sponsorship market dragged worldwide growth down to 4.3% and a total of $62.7 billion. 3 comments about "Sponsorship Spending Expected To Rise In 2018". John Grono from GAP Research, January 17, 2018 at 7:14 p.m.
Tanya, you say "the WPP-owned agency is forecasting a rebound this year in North America (which last year increased its spending by 3.6% or $23.1 billion)". I think that there may be an error in that statement. 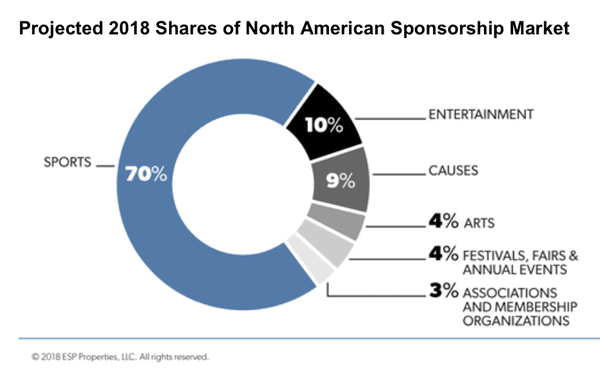 If North America increased by 3.6% and that increase was $23.1 billion, then the total vale of N. American sport sponsorship must be $641.7 billion. That seems an extraodinarily high figure. Tanya Gazdik from MediaPost replied, January 18, 2018 at 12:59 a.m. The total with the increase was $23.1 billion. I've changed "or" to "to." Hopefully that makes more sense. Thanks for the question. John Grono from GAP Research replied, January 18, 2018 at 2:30 a.m. Thank you Tanya, That makes sense now.